Whilst this doesn’t progress the story at all, I began to warm to Somerset Maugham. Eventually he gets onto his subject – Charles Strickland, who was a stockbroker, a boring, commonplace man who was large and clumsy looking, ‘just a good, dull, honest, plain man’. This boring man then left his wife and family after seventeen years of marriage and fled to Paris, because he wanted to paint. His wife and friends would have found it more acceptable if he had left her for another woman. I couldn’t think from the story why it was called The Moon and Sixpence but apparently the reason is that he took the title for it from an excerpt of a review of the earlier novel in the TLS in which the earlier novel’s main character is described as “so busy yearning for the moon that he never saw the sixpence at his feet.” Strickland yearns and lives to paint so much that I don’t think he sees anything around him at all. He’s a character who lives purely for himself and, obsessed with the desire to paint, just couldn’t care less about anyone or anything else. This book is roughly based on the life of Gauguin, which led me to look at Gauguin By Himself, a massive book that contains copies of his paintings, drawings, ceramic, sculpture and prints together with his written words. This is a beautiful book which I had almost forgotten was sitting on the bottom of the bookshelves, largely unread. The photograph is of his painting The Thatched Hut Under Palm Trees (1896-7) and as Maugham had visited the place where Gauguin lived I suppose that his description of Strickland’s hut was based on this hut. In the novel Strickland paints the inside walls of his hut with beautiful and mysterious paintings, giving the impression of being in a ‘great primeval forest and of naked people walking beneath the trees.’ Looking at Gauguin’s paintings one has the same impression. I disagree. After its unpromising start I think the book succeeds. 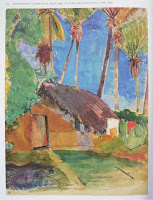 Maugham has conveyed to me the passion to create beauty behind Strickland’s (Gauguin’s) life. 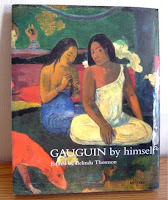 It has revived my interest in Gauguin’ work and makes me want to read more of Maugham’s novels and short stories. In my opinion he is not an outmoded author. I’ve only read Up at the Villa by Maugham–a fairly short novel, but was very impressed by it. I’ve yet to read any of his short stories, but I see them all over in anthologies. Sometimes it’s worthwhile sticking with a book that’s a slow starter as it turns out to be very good in the end. I think I’m more apt to set aside contemporary novels, but I like to try and stick with classics fuguring there is a reason they’ve been in print for so long. I definitely want to read more by him. Danielle, I agree. Since writing this I’ve been to the library and borrowed a collection of Maugham’s novels, with an interesting Preface to The Moon and Sixpence that Maugham wrote in 1933. I’ll have to do a follow up post! Admittedly it was years ago, but I loved this when I read it, as well as Cakes and Ale, which is about the life of Hardy. I like Maugham’s slow, digressive style because it’s elegant and reflective. I often feel transported back to an older world and think that’s a good thing. Litlove, once I got into it, after the first chapter I liked his style too. ‘Cakes and Ale’ is in the volume I’ve borrowed from the library – I didn’t know it’s about Hardy – I’ll have to read it soon. I read Cakes and Ale four years ago, and I hated it. I thought the characters to be mean-spirited and the book was boring. And then last year I read The Razor’s Edge, and though I liked it some better than C&A, I still didn’t care for it much. I think I’m going to give up on him. This was one of my favourite books when I was young, I thought Strickland felt like a real person, with his yearning for a more creative life. just read this book. maugham has this out of world style. strickland, a genius is constantlyat fight with his obession i.e. painting and his wordly desires.his sexual amores are nothing but expressions of a hungry half life aiming for whole. a must read for all artists. art for arts sake (walter pater) is maughams moto here. I recall crosing paths with Somerset Maugham in college where I read Moon and Sixpence in an English Lit course. Didn’t get too excited about him ’til I saw the film Razor’s Edge and thereafter, became a devoted Maugham fan. Over the years I guess I’ve read all of his stuff . I’ve found him to be the unchallanged master in writing short stories.